Hi, I am interested in your 1972 Chevrolet Chevelle (stock #CTP2325) listed on Autotrader for $25,900. I'd like to get more information about this vehicle and confirm its availability. 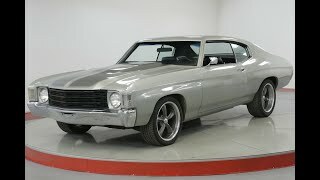 Worldwide Vintage Autos is pleased to present this 1972 Chevy Chevelle. The Chevrolet Chevelle is a mid-sized automobile which was produced by Chevrolet in three generations for the 1964 through 1977 model years. Part of the General Motors (GM) A-Body platform, the Chevelle was one of Chevrolets most successful nameplates. Body styles include coupes, sedans, convertibles and station wagons. Super Sport versions were produced through the 1973 model year, and Lagunas from 1973 through 1976. After a four-year absence, the El Camino was reintroduced as part of the new Chevelle lineup in 1964. The Chevelle also provided the platform for the Monte Carlo introduced in 1970. The Malibu, the top of the line model through 1972, completely replaced the Chevelle nameplate for the redesigned, downsized 1978 model year.